Saitō Toshimune, ?-1625, (here Saitō Toshimoto Nyūdō Ryūhon) was a son of Saitō Toshizō as was a brother of the well-known Kasugano Tsubone (1579 – 1643) who became the powerful leader of the ladies’ court. Toshimune was originally a subject of Akechi Mitsuhide and later became a vassal of the Katō Kiyomasa with whom he took part in the Korean Invasions, and of Tokugawa Hidetada (1579-1632) after Kiyomasa’s death. At a certain battle in Korea, one of the enemies was a huge man, ‘more than two metres tall’ with a ‘tiger-like beard’ whom nobody except Toshimume, also known as a strongman, dared to fight. Wrestling with each other, they fell into deep water. Eventually, Toshimume appeared victoriously on the surface of the water with the head of his enemy, earning high praise from Kiyomasa. 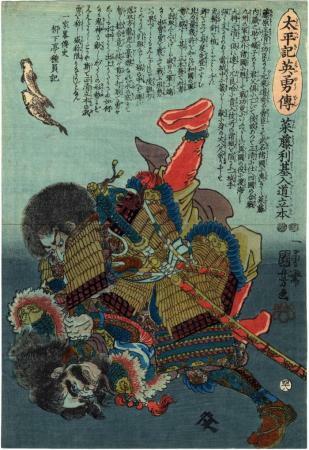 In this print, ‘Toshimoto’ is on top of his enemy fighting the Chinese hero underwater. "Saitō Toshimoto Nyūdo Ryūhon... is the son of Saitō Kuranosuke Toshimitsu and a retainer of Katō Kiyomasa (1562-1611). In this work he is depicted in an underwater fight with an opponent during the first Korean campaign (1592). This print, which is numbered 48, is one of the more spectacular scenes in the Taiheiki series. A similar underwater fight was designed by Kuniyoshi for his famous Suikoden series of c. 1827-30 and Kuniyoshi's student Tsukioka Yoshitoshi (1839-92) also illustrated the subject on a number of occasions." Quoted from: Heroes and Ghosts: Japanese Prints by Kuniyoshi 1797-1861 by Robert Schaap, p. 93. Yoshitoshi, Kuniyoshi's pupil, produced a print of this same subject, but with several changes. The Yoshitoshi print omits the text seen here written by Ryūkatei Tanekazu (1807-1858). It describes the underwater battle between Toshimune, the true name of the historical hero seen in this print, and a Goliath-like Korean warrior. "...over 2m tall... exceptionally strong and had a fine moustache resembling horns. As the fight escalates, they tumble into a nearby moat undeterred in their struggle. Toshimune [here Toshimoto] eventually emerges victorious with the decapitated head of his enemy in hand." Quoted from: Yoshitoshi: Masterpieces from the Ed Fries Collection, p. 74. Illustrated in a small black and white reproduction in The World of Tsukioka Yoshitoshi (Tsukioka Yoshitoshi no Sekai - 月岡芳年の世界) by Susugu Yoshida, p. 30.